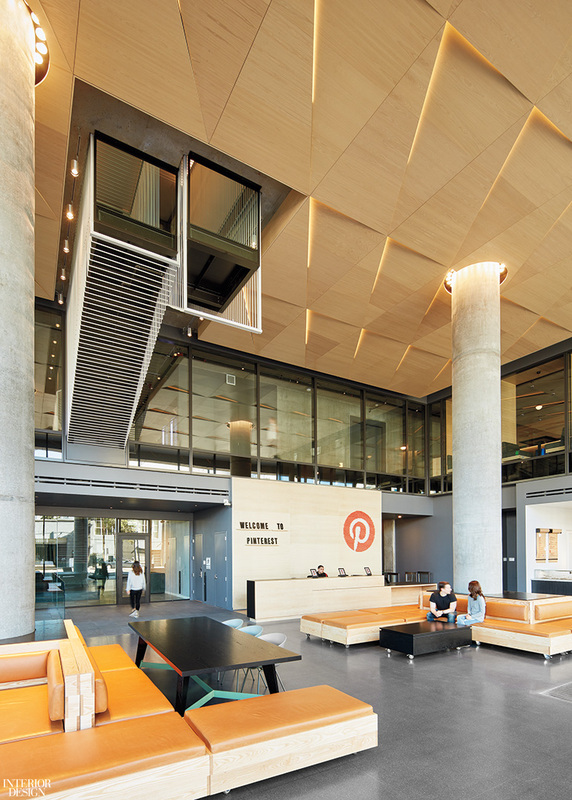 Fans of Pinterest might be surprised to know that its new headquarters is not, in fact, replete with white walls and red accents in the shade of its P logo. The free website and app are popular for their inspiration boards, created by “pinning” images against a simple white background. 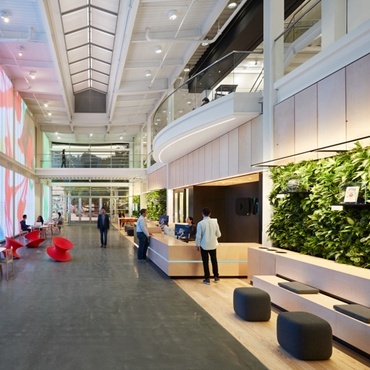 But in the latest, and largest, of Pinterest’s four San Francisco offices, the predominant color is a sober dark gray. 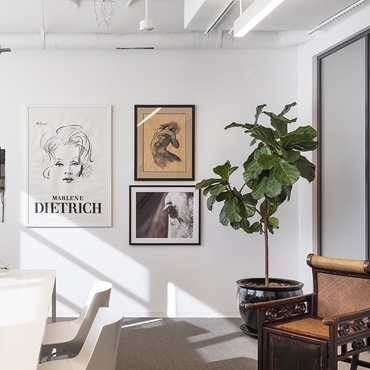 The approach of IwamotoScott, led by the husband-and-wife team of Lisa Iwamoto and Craig Scott, who had designed the tech company’s last headquarters, was to energize the space through interesting angles and views, emphasizing interior design’s subtler pleasures, with the help of Brereton as executive architect. Custom leather-upholstered sectionals and Hee Welling chairs furnish the lobby. Photography by Bruce Damonte. 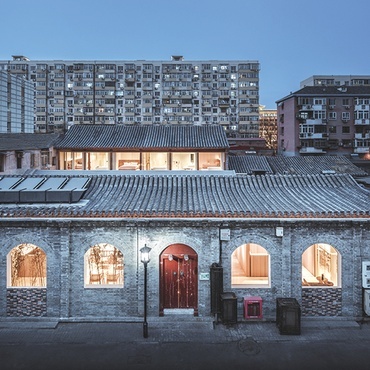 Located in the techy South of Market neighborhood, the building for the 940-person office hadn’t been constructed yet when IwamotoScott signed on, giving the firm an opportunity to make some strategic interventions. The resulting six-story structure has glass curtain walls on three sides and partial windows on the fourth. To counterbalance the amount of natural light coming in through all the glass, the team settled on that muted gray palette, apparent in the exposed concrete ceilings, acoustic felt surfaces, and painted finishes. Carefully detailed oak paneling and white oak magnetic floor planks, which allow access to utilities below, add warmth to the mix. The building also has an enormous double-height lobby, which, while oversize at present, already meets the city’s height requirements for a future expansion that will result in a 250-foot-tall high-rise. One of the primary challenges of this building was to join the six levels in a way that they would feel connected. 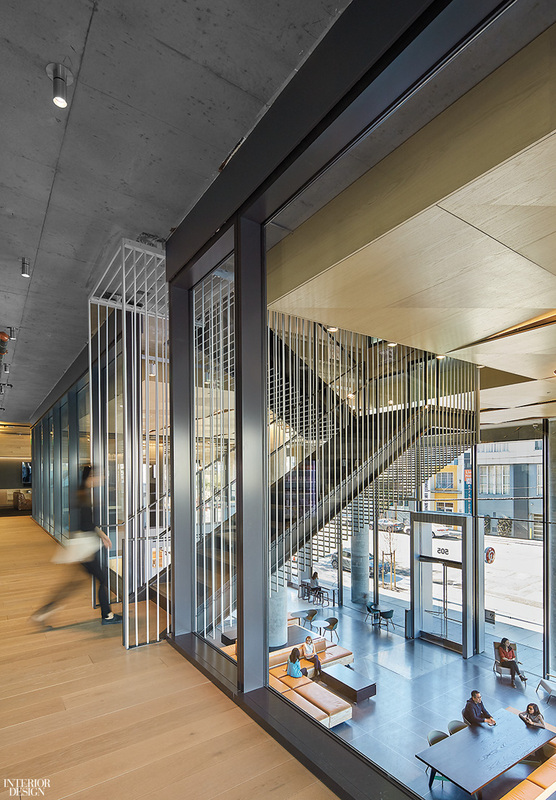 Working with Brereton Architects, which IwamotoScott first partnered with on the last Pinterest office in what Scott describes as an “arranged marriage,” the two firms created a stair that cantilevers over the publicly accessible lobby. It serves as both a dramatic sculpture and a visual bridge for the private and public spaces. 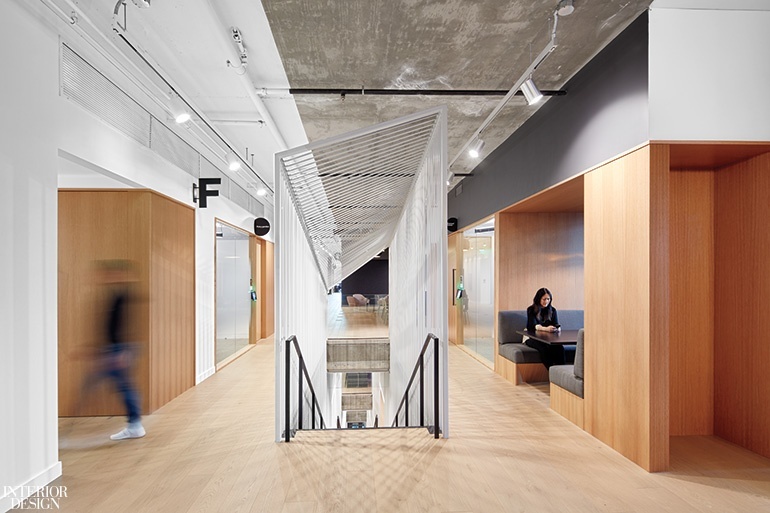 Outlined by screens of steel rods powder-coated, yes, a pale gray, the stairwell has a distinctive presence across all levels, an element that Pinterest has emphasized in each of its offices to encourage interaction. By pushing it forward into the lobby, the team was able to make it a cascading stair (versus a switchback), so that it offers a straight view from the top of the second story all the way to the sixth. “Stairs are much more inviting if you can see where you’re going,” Iwamoto notes. Perforated oak panels and concrete compose the ceiling plane. Photography by Bruce Damonte. 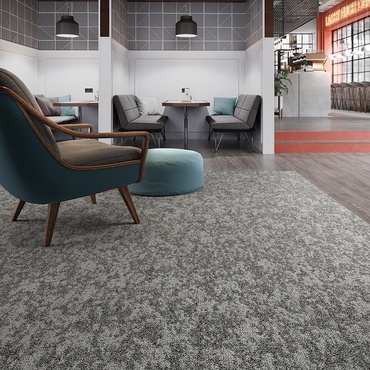 On the office levels, a variety of meeting rooms, lounges, and booths form a diverse work environment, along with adjustable-height desks arrayed in dense rows next to the exterior glass walls. In conference rooms, interior glass walls and narrow glass panels at the corners where the rooms meet allow in light and views. For privacy between those rooms and circulation areas, IwamotoScott added a patterned film that, when applied, results in glass that is translucent in the center but clear at the bottom and the top. 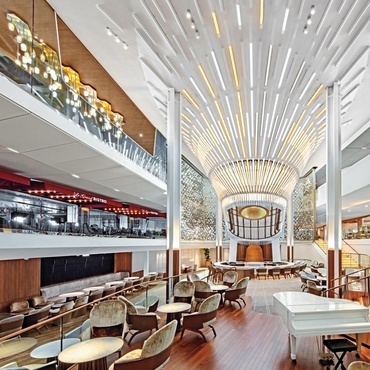 Ceilings get architectural attention in prominent gathering areas. In the lobby, for instance, an intricate pattern of triangular cove lights, rendered in micro-perforated oak paneling, provides visual interest and dampens sound. 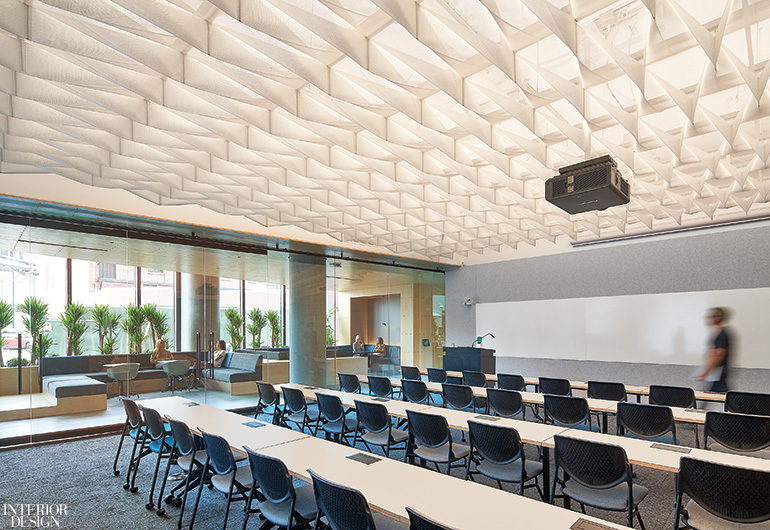 Nearby, the multipurpose room has an origamilike layer of nonwoven fiber mesh that diffuses light and hides the acoustic spray ceiling. 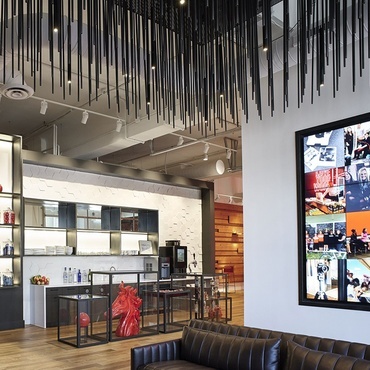 In a lounge, rows of glass globe pendant fixtures are cleanly wired into the exposed concrete ceiling—an intervention IwamotoScott was able to pull off because of its early involvement in the building design. In the cafeteria, X-shape fixtures start out as pendants, but are then integrated into the dropped acoustical tile ceiling. A custom light-diffusing layer of vinyl runs along the multipurpose room ceiling. Photography by Bruce Damonte. IwamotoScott did conceive one all-white space in the project. 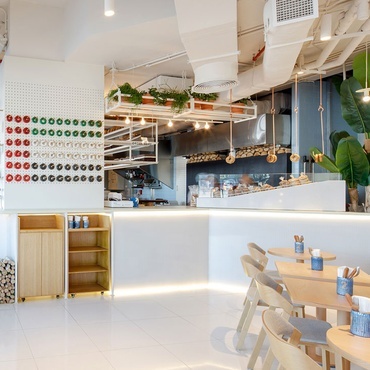 The lobby level has a public café, a retail component that was required by the city. Operated by Pinterest, it stands out from the rest of the ground level with its white penny tile on the floor and backsplash and white marble counters. People in the surrounding community come by for coffee and pastries—and perhaps snap pics to add to their own Pinterest boards. Matt Kendall; Maura Chen; Liam Cook; Pierre Barral; Trevor Larsen; Andrew Minnich: Iwamotoscott Architecture. Donna Kim Cook; Mandi Rice; Tanya Ayers; Michael Castro; Nicole LaFollette; Maeve Counihan; John Zaitz; Mattie Catherman; Abel Morales: Brereton Architects. Heller Manus Architects: Building Architect. Assembly Design: Graphics Consultant, Furniture Consultant. Lighting Workshops: Lighting Consultant. AVDG: Audiovisual Consultant. 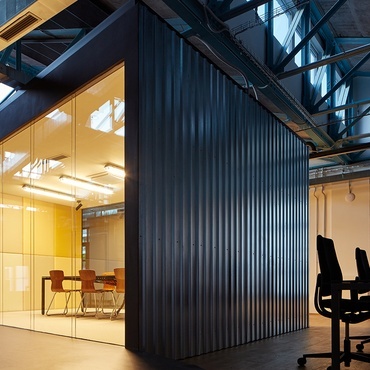 Charles M. Salter Associates: Acoustical Consultant. BuroHappold Engineering: Structural Engineer. Taylor Engineering: Mechanical Engineer. Engineering Enterprise: Electrical Engineer. Inside Source: Furniture Supplier. Mission Bell: Woodwork. C.E. Toland & Sons: Metalwork. Creative Ceilings & Drywall: Ceiling Contractor. Urbanworks: Project Manager. Hathaway Dinwiddie Construction Company: General Contractor.